58 • RV PRO • June 2017 rv-pro.com A F T E R M A R K E T I f you strictly go by television adver- tising, a generator is something used at home whenever the power goes out. And, there's certainly a large segment of the market for whom that's true. However, if you're taking your abode with you – whether it's a motorhome or a trailer – there are going to be plenty of times when you just might need a little extra power. A large generator that can keep the family well and furnace running isn't the answer. Enter the inverter generator – a fairly recent addition to the generator market that, thanks to some sophisticated elec- tronics – is providing the cleaner power today's RV users need, in a lighter-weight package that's also quieter. Huge Market If you think the recreational market isn't a big one for generator manufac- turers, think again. Most of them break down the total marketplace into three segments: home, work and recreation, which includes everything from boating to tailgating to camping. Matt Moose, product manager for por- table generators at Generac Power Systems in Waukesha, Wis., says while the biggest thing to consider with any generator is the amount of power that's being outputted, Power … to Go Today's inverter generators give RVers the power they need in a quieter, smaller and lighter-weight package. 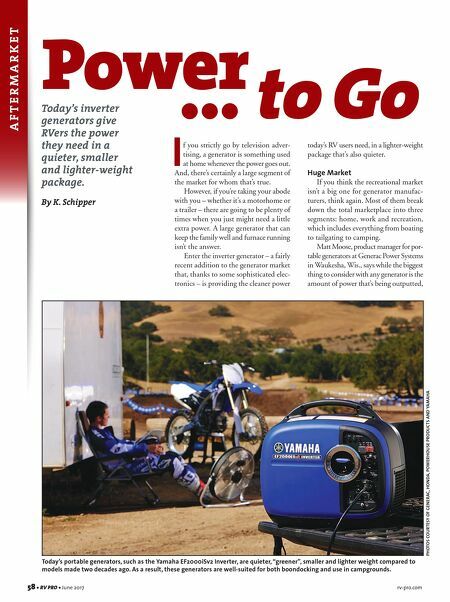 By K. Schipper PHOTOS COURTESY OF GENERAC, HONDA, POWERHOUSE PRODUCTS AND YAMAHA Today's portable generators, such as the Yamaha EF2000iSv2 Inverter, are quieter, "greener", smaller and lighter weight compared to models made two decades ago. 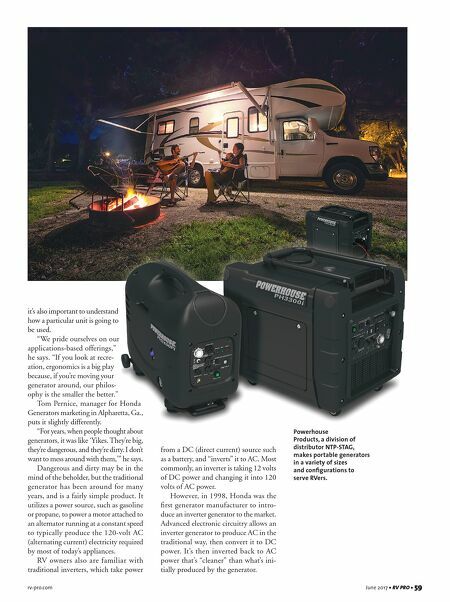 As a result, these generators are well-suited for both boondocking and use in campgrounds.